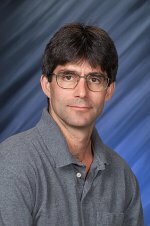 Congratulations to Dr. Greg Kimmel at Pacific Northwest National Laboratory on being elected a Fellow in the American Physical Society. He was recognized for his seminal contributions to understanding the structure and electron-stimulated reactivity of interfacial water. His studies, using low-energy electrons to mimic radiochemical reactions on surfaces, provide a detailed understanding of the physical and chemical processes occurring there. Kimmel is also known for his work on the structure of nanoscale water films at surfaces and interfaces. His research has identified a "hydrophobic" water layer that grows on a hydrophilic substrate, and a novel two-layer crystalline ice that grows on hydrophobic substrates. His research provides insights into the behavior of water, whether it is in fuel cells or on the icy moons of Europa. "In a lot of cases, water gets pretty complicated pretty fast," said Kimmel. "That's what keeps this research so interesting." His research has resulted in invitations to give talks at national and international conferences. For example, he gave an invited talk on electron stimulated reactions in thin water films at a recent Gordon Conference. Also, he spoke on hydrophobic water monolayers at ECOSS24 in Paris, France. His research has appeared in Science, Physical Review Letters, and numerous other journals.